Published January 27, 2019 Filed under US News, Utah, Utah Main. Total of no comments in the discussion. Over the past year, with little organized effort, thousands of Utah citizens simultaneously felt compelled to stand up and do what they could individually do to protect their own freedoms and the right to control their own destiny. It has been noted that UtahStandardNews.com played a substantial role by shedding light on the KMV/CMV struggle and in bringing people together by researching, documenting and publishing the internal UTGOP events that led to the birth of KMV as well as the corruption that exists in Utah politics and CMV. 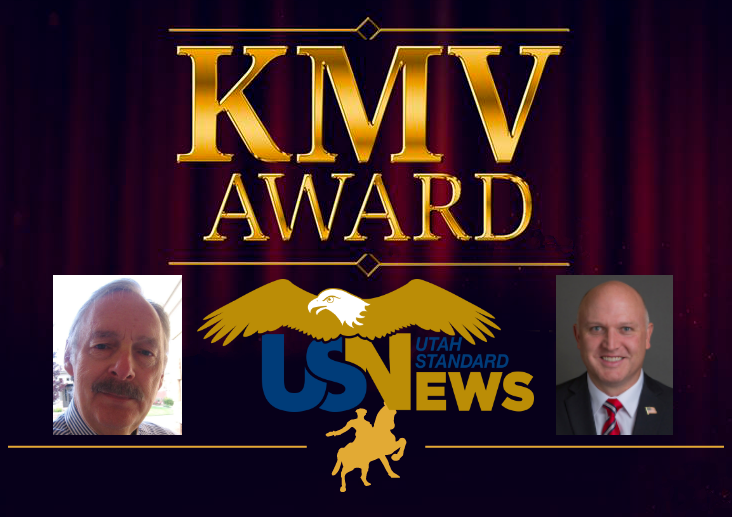 Ed Wallace and Utah Standard News won the KMV Award for most accurate journalism and “Utah’s Best Print Media”. Wallace is the creator and publisher of UtahStandardNews.com and is a staunch advocate for the return of the proper role of government and a defender of the Bill of Rights. Wallace, along with St. George attorney Larry Meyers (Liberty Law Firm) and Jake Albrecht (Flitch Creative), began publishing USN two years ago and has printed over 26,000 articles, reached over 100,000 readers, and is the only Utah-based media that covers the entire state in addition to reaching all 50 states and over 130 countries. At its core, USN is an independent entity, owned and operated by local neighbors with a vested interest in the events occurring around them. USN is not part of a media empire and strives to provide a refreshing alternative to right and left-wing opinion/news sites by presenting a principled source for news and commentary without the omissions, blatant lies, incomplete truths, diversions, politically correct distortions filled with deliberate propaganda and falsehoods, or any other form of deceit where the truth is avoided. Wallace states: “In Utah, the deep state does not ‘control’ the media. It doesn’t need to. They own some of it lock, stock and barrel and the ‘journalists’ themselves – some of whom believe they are actually doing real journalism work – are so blinded by the indoctrination that they simply can’t even understand what it was which we cherished so much in the so called Fourth Estate. These days there is absolutely no shame or stigma whatsoever for running an article which is overloaded with mistakes. The largest media outlets in the state have continually humiliated themselves by publishing articles, opinions and fake polls all in support of the ultra-rich and socialist agenda. The Deseret News has reportedly stated that they will never publish anything that supports a conservative cause. The SL Tribune (The Wasatch Pravda) has never met a liberal cause they didn’t love. The online Utah Policy, owned by LaVarr Webb and funded by Zions Bank, has been little more than a mouthpiece supporting SB54 and every other cause that the ultra-rich Oligarchy pushes. Dr. Ronald Mortensen wrote an exhaustive investigative article for USN revealing Utah’s elite titled “Report: Utah’s Oligarchs – Fighting to Maintain Their Political and Economic Control. Dr. Mortensen was recently nominated by President Trump to be the Assistant Secretary of State for Population, Refugees,and Migration and is awaiting confirmation by the U. S. Senate. Utah State Representative Travis M. Seegmiller, HD62 (Washington City, St George), received the “Rookie Legislator of the Year” award for his ongoing efforts to build a truly Conservative voting block of legislators up at the State Capitol while also focusing on preserving citizens’ Constitutional rights and freedoms at every turn. The state’s next General Session of the legislature begins on January 28th, 2019. Since he was chosen by WashCo HD62 delegates and then swiftly appointed by the Governor in early 2018, and later upon winning his recent election by earning over 10,000 votes, Seegmiller (and his voting record) was ranked by the statisticians as among the “Top 4” House Members who voted “NO” the most to bills encountered on the floor of the House Chamber. Representative Seegmiller is arguably the most qualified person that has ever served in Utah government. His resume, click here, is staggering in terms of experience and expertise in the areas of leadership, economics, business, government, policy and Constitutional rights. A rare conservative professor who teaches the U.S. Constitution, law, economics and leadership at Dixie State University, Seegmiller came out of the gate swiftly to fight for smaller government, lower taxes, in favor of Utah’s representative neighborhood caucus system, and especially in defense of Constitutional rights and liberties. Seegmiller quickly teamed up to form an informal “Cost Cutting Coalition” of other Fiscally Conservative legislator allies; he pushed rapidly to stop dangerous left-wing efforts; and he solidified his support among policymakers for budgetary priorities that would require huge surpluses to be given back to the taxpayers (Imagine That! ), or to be used to pay cash for existing projects, thereby avoiding bonding or going into debt; and, to fully fund new rainy day funds. State leaders recently decided to do just that, as they are now going to pay cash for much of the expensive prison project up north and they are shoring up our state’s rainy day funds in light of the large existing surplus. Given his track record, going into the 2019 General Session Seegmiller has been assigned again to some important Committees. He will continue to sit on the state’s complex Social Service Appropriations Subcommittee, providing oversight and budget guidance to one of the state’s largest appropriations budgets. And he has been added to the House Judiciary Committee which will tackle many sizable policy projects this session, a feat that is right up Seegmiller’s ally due to his work experience as a staffer on the U.S. Senate Judiciary Committee while he attended law school. Furthermore, Seegmiller will continue his work on the House Government Operations Committee in 2019, which efforts the liberal media has scrutinized since his first few days in office due to his constant attention to preserving voters’ Constitutional rights. Stay tuned to see what Seegmiller will accomplish over the next 45 days as the next legislative session unfolds, beginning on Monday. Note: Seegmiller continues to offer free, ongoing Constitutional Workshops for people of all ages in his legislative District #62. He provides free copies of the U.S. Constitution for all interested parties; and he will continue holding “Listening Lunches” — public town halls or informal gatherings on alternate Saturdays during the legislative session. He can be reached at tseegmiller@le.utah.gov or on his cell phone at (435) 236-5118. The author of each article published on this web site owns his or her own words. The opinions, beliefs and viewpoints expressed by the various authors and forum participants on this site do not necessarily reflect the opinions, beliefs and viewpoints of Utah Standard News or official policies of the USN and may actually reflect positions that USN actively opposes. However, in this instance, this doed reflect our opinion. The articles from our ‘Friends’ are under copyright and are published with permission. Any republishing of these articles is STRICTLY PROHIBITED without written consent from the original Publisher.